With advancing age, the time often arrives when older adults cannot continue living alone without assistance. When this situation occurs, a family may have several options for caring for an elderly person. Sometimes, a family might arrange for in-home care, or an elderly family member may move in with younger relatives. A nursing home is another possibility that may fit the needs of a senior citizen. Geriatric nursing facilities offer a variety of benefits, such as ongoing health care, assistance with daily personal needs, supervision to ensure safety, administration of medication, nutritional assistance, and opportunities for socialization. 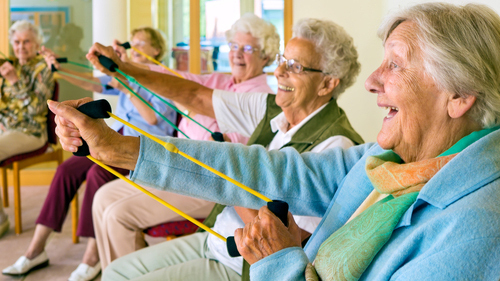 With admission into a nursing home, it's important to work to maintain the utmost in mental and physical wellness. Remaining as active as possible both physically and mentally usually has a positive impact on aging and overall health. Senior citizens usually have less strength and stamina than people in younger generations. However, this does not eliminate the need for regular physical activity in the form of exercise. Aerobic exercise is the type of activity that increases the heart rate and breathing rate. Walking and swimming are examples of aerobic exercise. Strength exercises involve some type of resistance that helps build muscle mass. Senior citizens might use light dumbbells or stretchy resistance bands for these exercises. Flexibility exercises involve gently stretching muscles, which helps keep them limber and flexible. Balance exercises can be very beneficial for older adults because these exercises may help with fall prevention. An example of an effective balance exercise is standing on one foot for a moment or two. Another exercise to try is standing up from sitting in a chair without using the hands. With advancing age, nutritional needs change. Although elderly people usually need less energy than younger people to carry out their daily activities, this does not eliminate the need for nutrients. Eating a nutritious diet helps older adults avoid some common health issues as well, such as heart disease, high blood pressure, and osteoporosis. To ensure the best diet, older people should eat a variety of nutritious foods, including fruits, vegetables, lean proteins, dairy, and whole grains for energy and fiber. Calcium remains an important mineral for older adults, and low-fat yogurt, cheese, and milk are excellent sources to help maintain strong bones. It's also beneficial to avoid empty calories, instead choosing foods that are full of important vitamins and minerals. Remaining hydrated is crucial for optimal health, so drinking small amounts of water or other fluids throughout the day is beneficial, too. Maintaining good mental health helps older adults feel good both physically and emotionally. While virtually anyone is at risk for the deterioration of their mental health, senior citizens can be at a higher risk due to specific factors. Declining health, chronic pain, bereavement, and loss of independence are some of the main issues that can cause either a sudden or a gradual decline in mental health. Depression can set in, brought on by loneliness and isolation. Dementia is also common, and it includes a deterioration in thinking and behavior that usually progresses until it affects daily activities. Alzheimer's disease is a specific type of dementia that gets progressively worse until an individual is unable to respond to people and activities. Following specific strategies, senior citizens can take steps to maintain their good mental health. Engaging in brain-stimulating activities such as word puzzles and reading is beneficial. Establishing and keeping a daily routine of standard activities is also helpful for staying healthy emotionally. For example, an elderly person might appreciate receiving a daily phone call or may like to watch a specific television show every day. Regular and meaningful socialization with others is also very important to seniors' mental health. This socialization may come from family members paying regular visits or from friendships maintained or established in a neighborhood or a nursing home. Bonding with others and engaging in frequent conversation helps keep the mind sharp and the heart fulfilled. What Does “Healthy Eating” Mean?